Tektronix, Inc., the world's leading manufacturer of oscilloscopes, recently announced the AFG2021 arbitrary/function generator that offers performance signal generation capabilities with entry level pricing. This new compact, easy-to-use signal generator is ideal for cost-sensitive education and manufacturing applications while offering the versatility to meet many R&D requirements. In the past, entry-level signal generation equaled limited functionality and flexibility. The AFG2021 changes that equation with performance features including 20 MHz bandwidth, 14-bit resolution, 250 MS/s sample rate performance and an intuitive user interface for a starting price of $1,590. Included in that price is Tektronix ArbExpresssoftware that lets users quickly create and import waveforms into the AFG2021 to meet custom stimulus requirements. "With the AFG2021 we're delivering the perfect blend of performance, versatility and affordability that customers in education, manufacturing and some research groups have been asking for in a signal generator," said Jeff Yost, general manager, Bench Instruments Product Line, Tektronix. "With this instrument, customers can easily and quickly create precise, higher-sample rate signals at prices that provide a 20 percent savings over other alternatives." 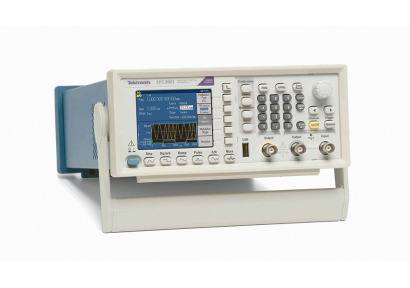 As a result of this blend of performance and lower cost educators are no longer forced to choose a signal generator that can only be used in entry level classes. The AFG2021's performance supports development of advanced course material involving more complex concepts such as serial data streams and modulated waveforms. For manufacturing applications the AFG2021 provides the same ease of use, functionality, computer connectivity and support software available with the Tektronix AFG3000 series, but in a smaller form factor ideal for rack mounting. For R&D applications, the ArbExpress software included with AFG2021 makes it easy to create new signals to test and validate systems. A standard 3 year warranty further lowers total ownership costs. The innovative ease-of-use features first offered on the AFG3000 Series arbitrary/function generators are incorporated into the AFG2021, providing quick access to setup and operational features. A 3.5 inch color TFT screen shows relevant parameters in both graphic and text formats. It includes 12 standard waveforms, modulation capability, and a built-in noise generator to thoroughly exercise designs. The AFG2012 offers a range of connectivity options for saving or downloading customized waveforms or instrument settings including both USB Host Port on the Front Panel and a USB Device Port on Rear Panel, plus the optional GPIB and LAN ports. The 2U height and half-rack width form factor allow the AFG2021 to be stacked on other bench instruments. For more than sixty years, engineers have turned to Tektronix for test, measurement and monitoring solutions to solve design challenges, improve productivity and dramatically reduce time to market. Tektronix is a leading supplier of test equipment for engineers focused on electronic design, manufacturing, and advanced technology development. Headquartered in Beaverton, Oregon, Tektronix serves customers worldwide and offers award-winning service and support. Stay on the leading edge at www.tektronix.com.